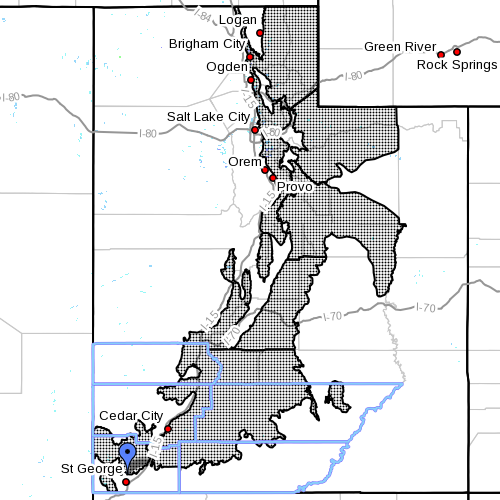 UTAH – The National Weather Service has issued a “Winter Storm Warning” for heavy snow in the mountains of Utah, in effect from 2 a.m. Thursday to noon Friday. The “Winter Storm Watch” issued Tuesday is no longer in effect. Wasatch Mountains, I-80 north; Wasatch Mountains south of I-80; Western Uinta Mountains, Wasatch Plateau/Book Cliffs; Central mountains; Southern Mountains, including the cities of Woodruff, Randolph, Alta, Brighton, Mirror Lake Highway, Scofield, Cove Fort, Koosharem, Fish Lake, Loa, Panguitch, and Bryce Canyon. Snow accumulations of 10-20 inches are expected with locally higher amounts on west-facing slopes. Snow will begin late Wednesday night and spread across the area by early Thursday. The snow will continue through Thursday afternoon then turn showery in the evening. Snow showers will continue into Friday morning before diminishing. Accumulating snow on area roads will create winter driving conditions. This includes all major routes across the mountains of Utah. A “Winter Storm Warning” for heavy snow means that significant accumulations of snow are expected or occurring. Driving conditions may be hazardous. Use caution. Keep a winter storm survival kit in your vehicle in case of emergency. My prayers and thoughts are with all of you that will be traveling for the holidays be safe be careful I hope you all reach your destinations and enjoy the company of your family and friends on the most joyous holiday of all Merry Christmas and festive New Year to each and everyone of you.